Found 4 file extension associations related to Alchemy and 2 file formats developed specifically for use with Alchemy. 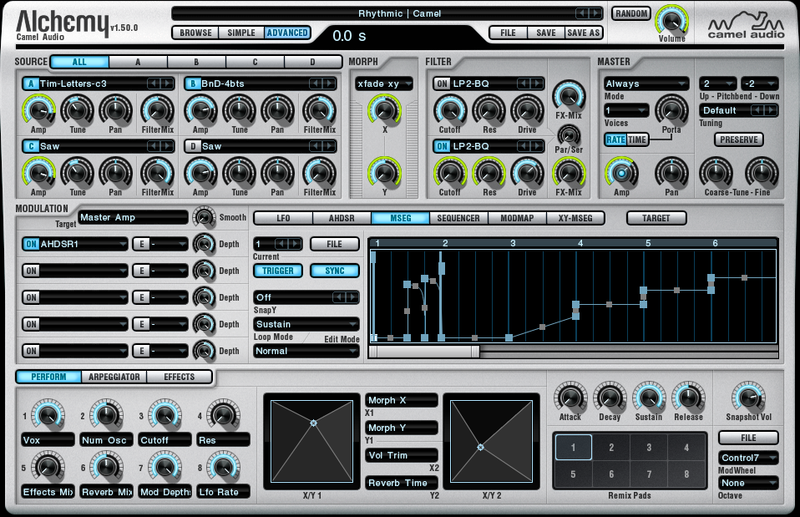 Alchemy is the ultimate sample manipulation synthesizer. It’s a synth powerhouse and yet is very easy to use thanks to its performance controls and remix pads. Just tweak the library of excellent presets from many of the world’s top sound designers or dive in and analyse your own samples – it’s up to you! Alchemy features additive, spectral and granular synthesis and resynthesis, sampling, and a very capable virtual analog engine with unison and PWM. You can morph or crossfade between sources. You can import your own samples from SFZ, WAV or AIFF files. A wide range of analog modelled filters is included, in addition to a flexible rack of effects which includes all those from CamelPhat and CamelSpace as well as many new effects such as a high quality reverb. The innovative modulation system is extremely flexible, yet easy to use. Alchemy also features a powerful arpeggiator with the ability to import the groove from any MIDI file for immediate synchronization to a beat. Alchemy ships with over 5.5GB of samples and analysed content from in-house designers Tim Conrardy and Biomechanoid, as well as designers such as Ian Boddy, Robert Rich, Scott Solida, Nucleus SoundLab and others. A library of over 650 excellent presets from many of the world’s top sound designers is included, arranged into categories for rapid access to the sound you require. The Alchemy software seems to be old or discontinued. If you need more information please contact the developers of Alchemy (Camel Audio Limited), or check out their product website.